Let’s get this out of the way: “Ankylosing spondylitis is not a man’s disease. I get so tired of hearing that,” says CreakyJoints member Regan Reynolds, of North Carolina, who was diagnosed with ankylosing spondylitis (AS) in 2002 at age 22. Ankylosing spondylitis is an inflammatory form of arthritis that primarily affects the lower back and sacroiliac joints, where the spine connects with the pelvis — though it frequently causes pain in other joints, as well as such systemic symptoms as inflammatory bowel disease and psoriasis. People with AS have damage to their sacroiliac joints that is visible on X-rays; those with a related disease called non-radiographic axial spondyloarthritis (nr-AxSpA) have similar symptoms as ankylosing spondylitis, but without damage you can see imaging. Many people have never heard of ankylosing spondylitis until they or someone they know gets diagnosed with it, but it’s more common than you think. A 2012 study published in the journal Arthritis Care & Research estimates that spondyloarthritis — a group of related types of arthritis that includes AS — affects up to 1 percent of the U.S. population, or roughly 3 million people. It’s likely that more people are living undiagnosed. The common perception of AS is that it’s a type of arthritis that predominantly affects men. While we now know that’s not true (more on that below), the myth isn’t one to take lightly. 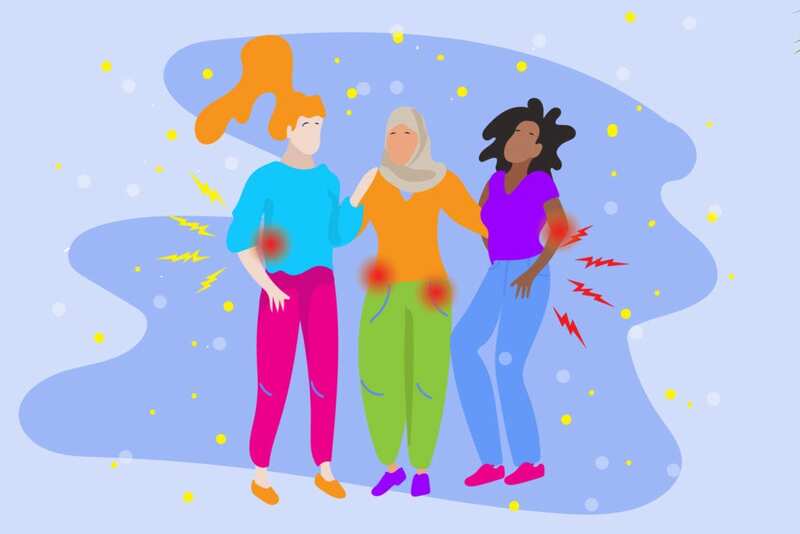 The research on how ankylosing spondylitis and axial spondyloarthritis affects women is fascinating, ongoing, and sometimes contradictory. Here’s what we know now about ankylosing spondylitis in women. According to the authors of a research review about AS in women, “a bias that AS affects men almost exclusively has existed even through the first half of the twentieth century.” Earlier estimates figured the male-to-female ratio to be in the area of 9:1; today, data suggests the ratio is much more even. Some estimates say 2 – 3:1. One population study of Canadians in Ontario, which looked at the prevalence of AS between 1995 and 2010, found that although men had greater prevalence of AS throughout the study, the male/female ratio decreased significantly over time from 1.70 in 1995 to 1.21 in 2010. In other words, AS is more common in men than in women, but not by nearly as much as previously thought. But if both doctors and women living with AS symptoms don’t know about AS or suspect it as a cause of women’s back pain, it can lead to significant delays in getting diagnosed, on proper treatment, and on the path to feeling better. That’s what happened to Charis Hill, of Sacramento, California, who grew up watching her father become increasingly disabled from AS. But she also grew up mistakenly thinking that AS was something that affected only men, so it wasn’t something she would ever need to worry about. “I was convinced I wouldn’t get AS because I was a girl, and this was a ‘man’s disease,'” she recalls. When she started seeing various doctors in college because of back pain and other symptoms — which were ultimately chalked up to sports injuries because she was a college soccer player — she never even thought to suggest AS as a possibility because it wasn’t on her radar. The pain and stiffness from ankylosing spondylitis can strike not just in the lower back, pelvis, and hips, but other joints as well as entheses, which are connective tissue that link ligaments and tendons to bones. Translation: AS can make you hurt all over and be significantly debilitating. Now, imagine going undiagnosed with AS and living like this for years — and sometimes decades. Older research found a staggering discrepancy in how long it typically took women to get diagnosed with ankylosing spondylitis compared with men. One study from the 1970s found that for men, it was an average of three to four years; for women, the diagnosis delay was 10 years on average. More recent research from 2017 — a large meta-analysis that combined the results of 42 different studies and totaled 23,889 patients, 32.3 percent of them women — showed the average delay in diagnosis for males was 6.5 years, compared to 8.8 years for women. “The reasons for this under-diagnosis could include a continuing bias of AS being a disease of only men or differences in the disease expression in women that could cause delayed or missed diagnoses,” according to the study authors of a research review on AS in women. According to an article on Medscape, “radiographs [X-rays] are the single most important imaging technique for the detection, diagnosis, and follow-up monitoring of patients with ankylosing spondylitis.” While doctors take into account a patient’s history, physical exam, and bloodwork while diagnosing ankylosing spondylitis, seeing damage to bones on X-rays is what clinches the diagnosis. However, this radiographic damage is more likely to occur in men than in women, research shows. This may be a considerable reason that women don’t get diagnosed with ankylosing spondylitis as readily as men. When you have symptoms of AS but no radiographic damage, you may have a condition called non-radiographic axial spondyloarthritis (nr-AxSpA). Women may be more likely to be diagnosed with nr-AxSpA than men. The challenge, though, is that newer biologic medications used to treat some AS patients are not yet FDA-approved for people with non-radiographic axial spondyloarthritis (though that may change as the FDA is considering this new indication). If women are more likely to have nr-AxSpA than men, they may also be more limited in their disease treatment options. Do symptoms of AS present differently in men than in women? The answer depends on which studies you look at, since results vary. Some research has found that women with AS tend to have more pain in their cervical spine (neck) and peripheral joints (such as ankles and knees) than men. However, other research has not found differences between men and women in terms of which joints are affected by AS. In addition to causing lower back and joint pain, AS is associated with a host of “extra-articular” symptoms, which are symptoms that affect areas other than joints. It may be the case that women are more likely to have these symptoms than men, which can also affect AS diagnosis delays. Multiple studies have found that female AS patients experience more inflammatory bowel disease than male patients do; research also shows a higher prevalence of psoriasis, an inflammatory skin disease, in women than in men. Perhaps the only thing worse than doctors not knowing what’s wrong is assuming the wrong thing is what’s wrong. According to CreakyJoints patient research, 96 percent of people ultimately diagnosed with AS had at least one misdiagnosis first. This can not only delay getting diagnosed but also possibly put you on unnecessary treatment that won’t help you feel better. Research shows that women who report having widespread pain are twice as likely to have a delayed AS diagnosis as those who don’t. The most common misdiagnosis: fibromyalgia, which has some overlapping symptoms with AS. The two mainstays of drug treatment for AS are non-steroidal anti-inflammatory drugs (NSAIDs), which help reduce inflammation and relieve pain, and biologics, which target specific parts of the immune system to reduce inflammation and possibly even stop disease progression. Research shows that anti-TNF biologics (medications in this class include Humira, Enbrel, Cimzia, and others) don’t work as well in women as in men. One study published last year found that only 52 percent of women who took anti-TNF drugs for their AS experienced a 20 percent improvement after one year, compared with 63 percent of men. Only 18 percent of women achieved low levels of disease on the Ankylosing Spondylitis Disease Activity Score, compared with 26 percent of men. Not surprisingly, going longer without a proper diagnosis and treatment can impact the way women cope with AS compared with men. Research from our ArthritisPower research registry presented at the American College of Rheumatolgy’s 2018 annual meeting found that there were considerable gender differences in how AS affected patients’ quality of life. In nearly all cases, women reported that AS took a greater toll on their relationships than men did. For example, while 45 percent of women said that AS caused difficulty maintaining friendships, only 25 percent of men did. In many cases, women reported that AS affected their ability to function well at work more than men. Twenty nine percent of women said they were frequently late to work compared with 12 percent of men, for example. And 24 percent of women said they even had to switch their job as a result of AS, while only 15 percent of men said the same. Other research suggests that certain AS side effects, such as fatigue, night pain, and sleep disturbance, may affect women more than men. And women who have AS and fibromyalgia or other co-occurring types of chronic pain may have different pain sensitivity that affects how they handle quality of life issues. One of the best things women can do is make themselves aware of common ankylosing spondylitis symptoms, as well as differences in mechanical vs. inflammatory back pain, and make sure to press the doctor to see if AS could be a possible diagnosis for you (or family members or friends). “You have to find a doctor who cares about you more than they care about what you are likely to be. And that’s a hard thing to find for anyone, but especially women,” says Hannah Moskowitz. Interested in having a voice and participating in research about arthritis and ankylosing spondylitis? Consider signing up for ArthritisPower. ArthritisPower is the first-ever patient-led, patient-centered research registry for joint, bone, and inflammatory skin conditions. Learn more and sign up here. You can also join the 50-State Network, our grassroots patient advocacy organization, to become a patient advocate and help fight for better access to health care for those living with chronic disease. Learn more and sign up here. What should I do with a DISH diagnosis with increasing pain as well as possible involvement of other joints. I have had two major rotator cuff repairs, an operation on my wrist for a ruptured tendon, bilateral TKR, severe facet arthropothy, and ongoing back problems, and some deposition disease in my knees that used to be called pseudo gout but now goes by some initials I can’t remember. I am 73 years old. Any suggestions of how to best take care of my body?